The Greg Norman Weatherknit Birdie polo provides protection during all kinds of weather conditions. The polo features Weatherknit, a collection of technologies that protect you from the elements. Technologies include UV, rain and wind protection; heat retention to keep you warm when the weather cools down; and PlayDry moisture wicking, a technology that draws sweat away from the skin to keep you cool and dry when the temperature is high. The Weatherknit Birdie is constructed with polyester stretch fabric that provides a comfortable fit, allows natural movement without restriction, and offers resistance against shrinking, mildew and wrinkles. 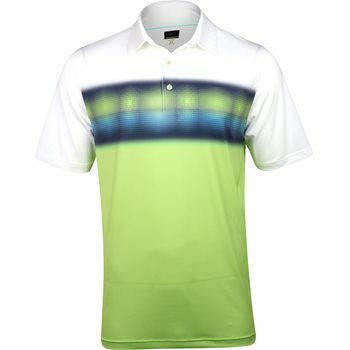 Design details include a mesh back, ombre grid chest print, a tailored collar, the raised Shark logo at the right back yoke, and a three button placket that allows closure adjustability.